See our Patterns Dictionary for other patterns. 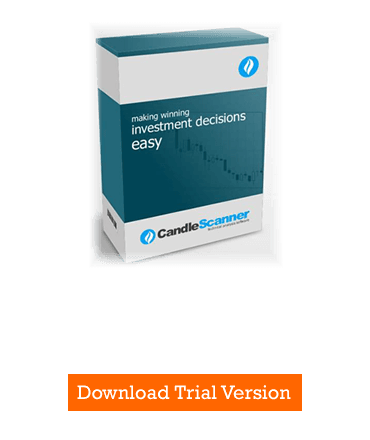 Check our CandleScanner software and start trading candlestick patterns! Figure 1. Three Outside Down pattern. Greg Morris proposed the three-line Three Outside Down pattern as an extension of the two-line Bearish Engulfing pattern. Its first and second line forms the Bearish Engulfing pattern. The first line can appear as a short or long line. It can be any basic candle having a white body. Doji candles are allowed except the Four-Price Doji. The second line has to appear as a long line, and the candle needs to be of black color. It can be one of the following candles: Black Candle, Long Black Candle, Black Marubozu, Opening Black Marubozu and Closing Black Marubozu. Spinning tops and doji candles are not allowed. The last candle line can be any basic candle, which has a black body and closes below the second candle's closing price. The length of the shadows does not matter for any line. The Three Outside Down pattern appears in a downtrend predicting its reversal. Although the third line is a kind of a confirmation of the Bearish Engulfing, it is worth to wait for confirmation on the subsequent candles. In other words, it is recommended to see if the price breaks out of the nearest resistance zone or a trendline. Depending on the market, if a trading volume information is available, typically it should be significantly higher on the third line of the pattern. Figure 2. A Bearish Engulfing pattern and a Black Candle forms a Three Outside Down pattern. The Black Candle, preceded by a price gap, appeared below a trendline indicating that the bears are in control of the market. After a Falling Window pattern (small price gap at a high trading volume), the bulls tried to move price up but failed. Figure 3. An Opening Black Marubozu (1) forms a resistance area which is broken nine days later by a White Candle acting as a support zone. 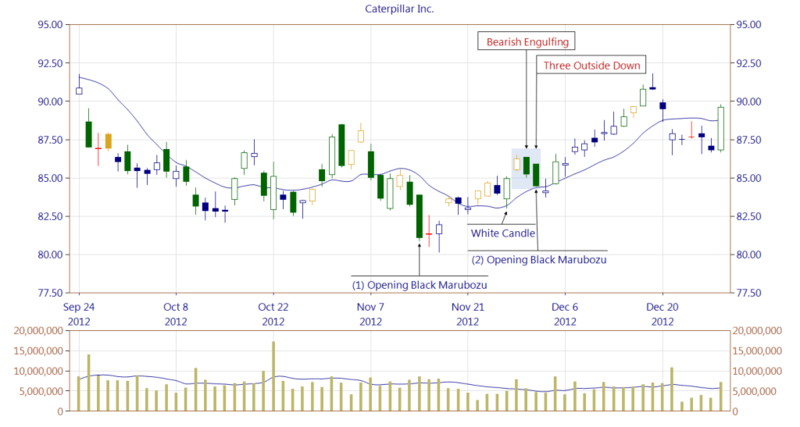 A Bearish Engulfing is followed by an Opening Black Marubozu (2) and creates a Three Outside Down pattern. The support zone set up by the White Candle works well, and the bulls are in control of the market again. This chart can be an example presenting why even Three Outside Down pattern (and other three-line patterns extending two-line patterns) should be confirmed. Below you can find some Three Outside Down pattern statistics calculated by CandleScanner software. To see more detailed statistics, for other markets and periodicity try our CandleScanner software. Prices start at only $10, and you can see more detailed statistics, for other markets and periodicity. Click here to find out more! 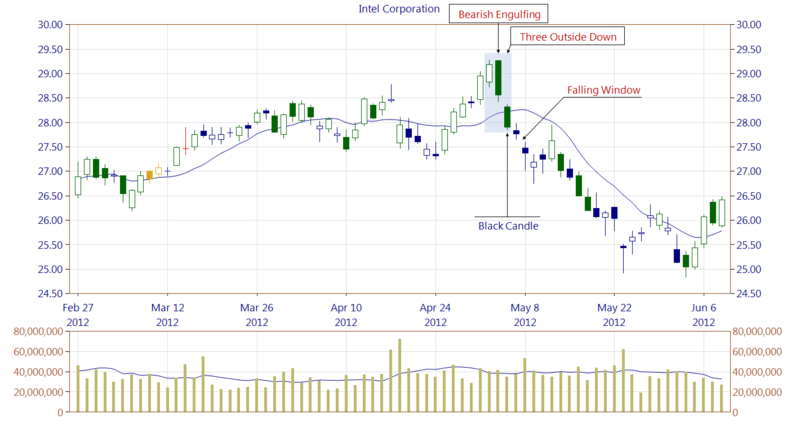 Scan candlestick charts to find occurrences of candle patterns. Subscribe to get a free PDF with an introduction to candlestick patterns! How to measure the efficiency of a candlestick pattern?